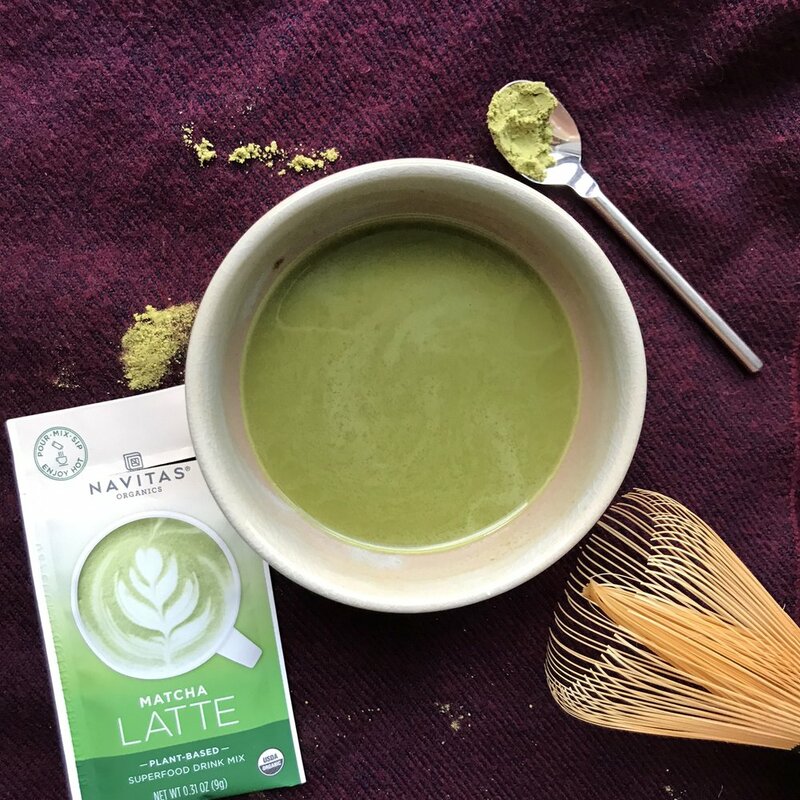 Navitas organics recently released a line of superfood latte mixes. Navitas Organics is a certified B corporation, and their products are certified non-GMO and USDA organic. (1) The mixes come in three blends: cacao, matcha, and turmeric. Each latte mix comes in a single-serve packet, which is meant to make it easy, convenient, and tasty. All you have to do is mix the packet with water, milk, or a milk alternative and it is ready to drink! All of their mixes are vegan, keto, and paleo-friendly, while containing 2 grams of MCT (medium-chain triglycerides) per serving from coconut oil powder. (1) Let’s review why they may have chosen these ingredients to feature. First of all… Why MCT? If you’re a matcha lover, you may be thrown off by the taste of the matcha latte mix. If you ’ve tasted straight matcha powder or matcha tea, it has a rich bitter taste. Due to other ingredients, the bitterness from the matcha is stunted. Since the mix contains ingredients such as MCT oil and sugar, each serving contains 40 calories, whereas pure matcha powder contains 0 calories; if you’re not looking for a way to stay satiated and just want to enjoy your matcha, you may want to go for pure matcha powder instead. The turmeric mix has a distinct taste, but not overpowering because of the sweetness. One issue with the turmeric mix is that it was difficult to dissolve in cold milk; it created clumps rather than dissolving. If you are able to pass the clumpiness that may leave a dryness while going down your throat, then this could be enjoyable. Last, but definitely not least, was the cacao mix. I used soy milk for this one, and made sure to heat it for about as much time as I would heat water for tea; I wanted to see if the heat of the liquid would help dissolve the mix. Unfortunately, the temperature did not help; just like the turmeric mix, it did not completely dissolve, no matter how long I stirred it for. That being said, in terms of taste, this latte mix takes the prize. Since the mix is sweetened with coconut palm sugar, it pretty much tasted like hot chocolate. I thought, ‘ could definitely drink this on a regular basis!’ For comparison, a regular hot chocolate mix contains 80 calories per serving and 12 grams of sugar, whereas the cacao latte mix contains 40 calories and 3 grams of sugar. (1,12) I would consider this a healthier way to satisfy a hot chocolate craving! I wouldn’t recommend this as a way not to get energy from regular food or skipping meals. The curbing effect is there, but it doesn’t beat coffee. To fortify the potency of satiety and by adding a little protein to this drink, consider adding Fairlife 2% milk with DHA milk. One cup is 130 calories, 13 grams of protein, 4.5 grams of fat, 2.5 grams of saturated fat, low carb with 8 grams of carbohydrates, and 35% of your calcium needs. Other nutrients included are Vitamin A, C, D, E, and B12, potassium, riboflavin, phosphorous, magnesium, and zinc. Superfood Latte Mixes. Navitas Organics. 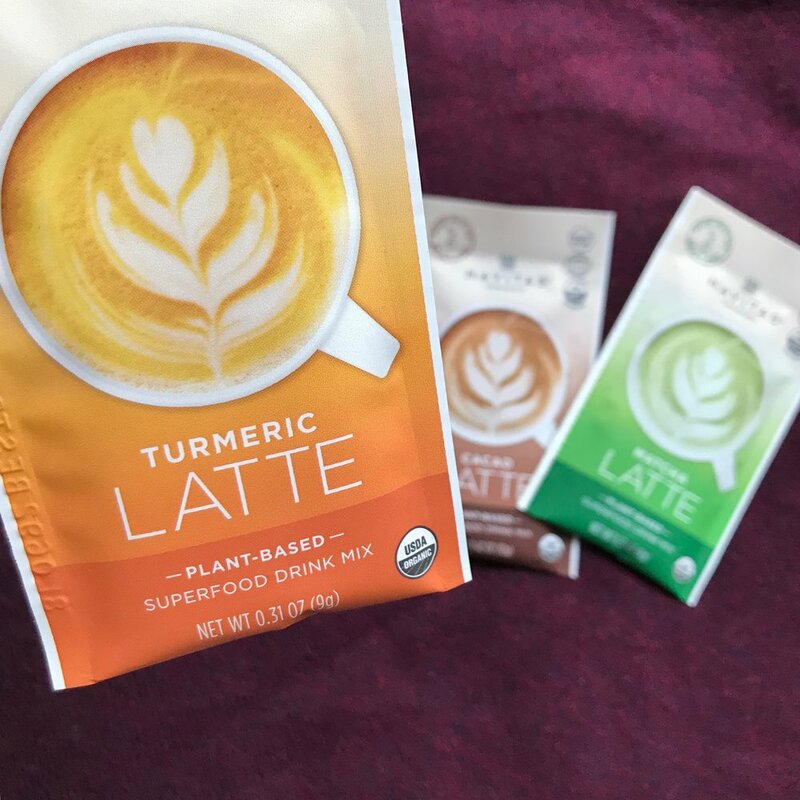 https://navitasorganics.com/collections/new-superfood-latte-mixes. Accessed on March 15, 2019. Kinsella, R. Coconut oil has less satiating properties than medium chain triglyceride oil. Physiology and Behavior. October 1, 2017. https://www.ncbi.nlm.nih.gov/pubmed/28689741. Accessed on March 15, 2019. Mumme, Karen. Effects of Medium-Chain Triglycerides on Weight Loss and Body Composition: A Meta-Analysis of Randomized Controlled Trials. Journal of the Academy of Nutrition and Dietetics. February 2015. https://jandonline.org/article/S2212-2672(14)01591-3/fulltext. Accessed March 15, 2019. Shoba, G. Influence of piperine on the pharmacokinetics of curcumin in animals and human volunteers. Planta Medica. 1998. https://www.ncbi.nlm.nih.gov/pubmed/9619120. Accessed on March 15, 2019. Jurenka, JS. Anti-inflammatory properties of curcumin, a major constituent of Curcuma longa: a review of preclinical and clinical research. Alternative Medicine Review. June 2009. https://www.ncbi.nlm.nih.gov/pubmed/19594223. Accessed March 13. Ying, Xu. Curcumin reverses the effects of chronic stress on behavior, the HPA axis, BDNF expression and phosphorylation of CREB. Brain Research. November 29, 2006. https://www.sciencedirect.com/science/article/pii/S0006899306027144. Accessed March 12, 2019. Cacao Powder. Navitas Organics. https://navitasorganics.com/collections/all/products/cacao-powder. Accessed March 17, 2019. Palanisamy, A.Role of Antioxidants and Natural Products in Inflammation. Oxidative Medicine and Cellular Longevity. October 10, 2016. https://www.ncbi.nlm.nih.gov/pmc/articles/PMC5075620/. Accessed March 17, 2019. Dietz, C. An intervention study on the effect of matcha tea, in drink and snack bar formats, on mood and cognitive performance. Food Research International. September 2017. https://www.ncbi.nlm.nih.gov/pubmed/28784536. Accessed March 14, 2019. Dodd, FL. A double-blind, placebo-controlled study evaluating the effects of caffeine and L-theanine both alone and in combination on cerebral blood flow, cognition and mood. Psychopharmacology. July 2015. https://www.ncbi.nlm.nih.gov/pubmed/25761837. Accessed March 14, 2019. Nobre, AC. L-theanine, a natural constituent in tea, and its effect on mental state. Asia Pacific Journal of Clinical Nutrition. 2008. https://www.ncbi.nlm.nih.gov/pubmed/18296328. Accessed May 15, 2019. Nestle Milk Chocolate Flavor Hot Cocoa Mix. Nestle Professional. https://www.nestleprofessional.us/nestle-hot-cocoa/nestle-milk-chocolate-flavor-hot-cocoa-mix-packets. Accessed March 19, 2019.